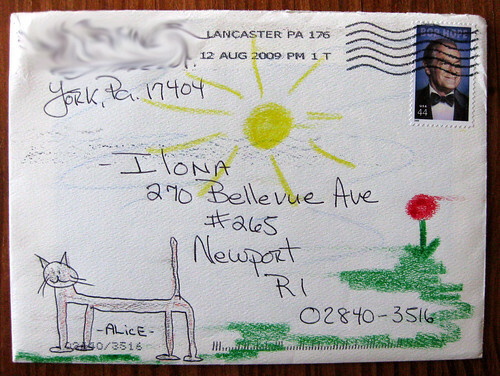 This pen pal often draws very charming pictures of her cat, Alice, on envelopes. I love the crayon. She also makes cards by gluing a photo onto some nice card stock - an excellent do-it-yourself alternative to expensive photo-printed cards. And of course, I love getting to see Alice the cat! Lol your correspondent makes the cat very long and skinny in her drawing. Makes me wonder if the cat "Alice" is really that way? Or is that just a childs interpretation of a cherished pet? Alice is so cute! What a day-brightener, to get such a letter! 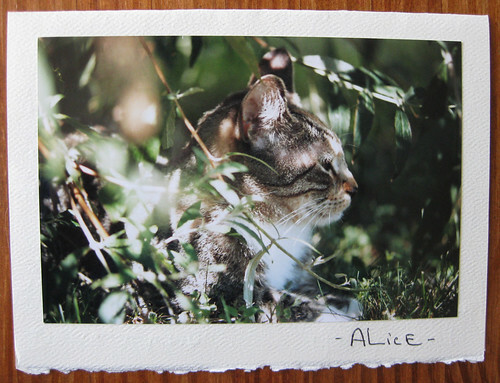 okay alice is a cutie and yes how cute the envie . I love my mail art and try it every chance I get . The picture on cards is what I've done several times. It makes a really nice, personalized gift for just a little money.